Tamarind adds a tangy, piquant lift to many dishes to whet the appetite. 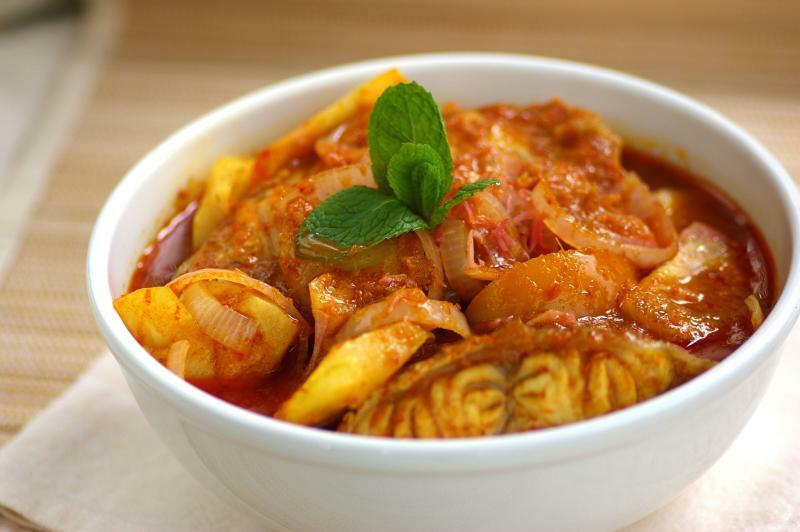 In this recipe for Assam Fish Curry, it incorporated dried tamarind apple (asam keping) beautifully with the garoupa fish. Cut the fish into 3 thick slices and season with salt. Set aside for 10-15 minutes. Heat oil in a large saucepan. Fry lemongrass and polygonum for 10-20 seconds. Add ground spice ingredients and fry over medium-low heat until fragrant. Add tamarind juice and bring to the boil. Add tamarind apple, pineapple, tomato and onion. Add the fish slices and season to taste. Cook for 5-6 minutes, or until fish is cooked. Add a sprinkling of wild ginger bud and mint leaves. Dish out and serve hot with rice.